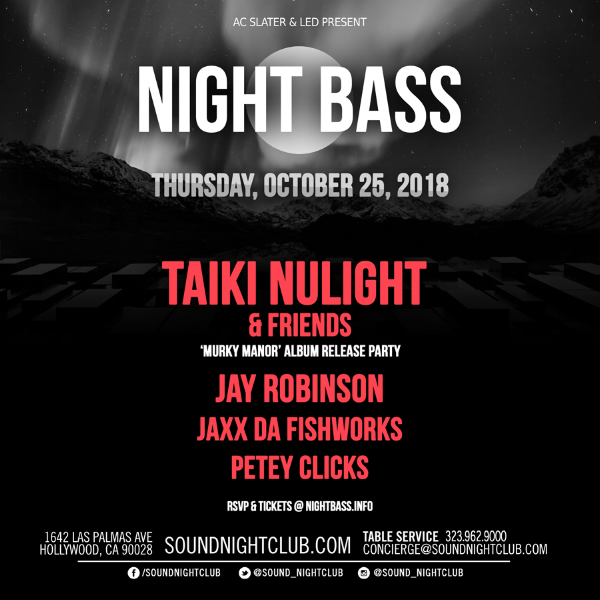 Night Bass is back at Sound Nightclub on October 25th, so come get spooky with us & kickoff the release of Taiki Nulight's new album, Murky Manor. Alongside Jay Robinson, Petey Clicks, Jaxx Da Fishworks & Taiki Nulight, we're expecting some very special friends so get your tickets now by clicking the link below! It's a Night Bass thing.. Happy Halloween. Sign up with your email address to receive news about events, merchandise, releases and special perks. We respect your privacy, thanks for subscribing!